All Bioflect® garments are bacteriostatic, keeping odors under control. Comfortable Compression. Cooling, Energizing Support. Affordable. Perfect! 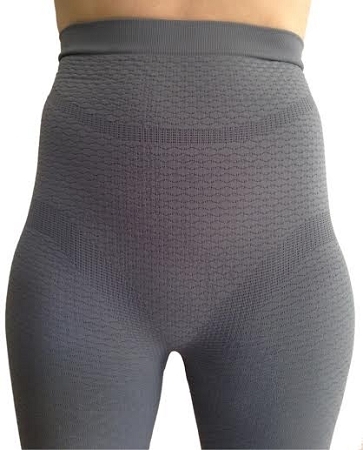 Recently diagnosed with Lipedema, (a genetic disorder that causes all-over lymphedema-type water retention) I went in search of compression garments as prescribed by my physician. Since I am required to wear compression for arms, legs, and trunk year-round, I needed something functional, versatile, and affordable. My first experience was with custom-made garments that looked atrocious and were so painful to wear. When I found this product, I LOVED IT!!! Because they are so understated, they do not draw undue attention and are easy to incorporate with most outfits--casual to professional. I wear the capri pants for leggings under dresses and with jean pants and capris. The stretch and breath-ability of the materials create comfortable compression support without causing pain or overheating like Lymphedema products can. After a few months of wearing these, I have been able to see a decrease in the measured circumference of my thighs, knees, and buttocks, as well as a marked difference in the firmness of my skin and a lessening of stored lymphatic fluids, resulting in a drastic decrease in pain. I have tried others on the market and these are as high of quality, but better priced and non see-through. The only drawbacks of these compared to the other brand I tried is that 1. )these are not currently covered by insurance for therapeutic compression, and, 2. )you better get your size right because there are no returns. Being compression garments, they are great for workouts and provide a cooling effect on hot days when misted with water. I highly recommend these capris for any type of Lipedema or Lymphedema compression garment needs. Sizing was spot on. I really like the feel of the material and don't seem too hot which is important for wearing in heat and humidity. Will order more. "bring me hours of relief"
Just received these and I LOVE them!! I'm always looking for new products to give me relief from my leg pain. (terrible circulation). I have about 5 other pairs of very expensive compression garments and these are officially my absolute new favorites. They are very, very comfortable and bring me hours of relief....and they looks pretty good too! I LOVE THEM!! I noticed a difference the very first time I had them on. I sleep in them and they are not too hot or too uncomfortable. I hardly know I have them on. I also wear them to the gym under my yoga pants. I have been searching for something like this ever since the Medisana shorts, capris and slacks were discontinued. I have become a huge fan of your products and will be placing future orders for another set of capri pants and the arm compression thing. I just received my capri pants and love them. I wore them all day and found them extremely comfortable. I would love to see them offered in beige or white for under summer clothing. I will definitely be ordering more of these.